In a sign of Republican desperation to retain control of the Senate this fall, GOP leaders are encouraging Sen. Marco Rubio of Florida to change his mind and run for reelection. Rubio spent more than a year on the presidential campaign trail trashing the Senate as a legislative wasteland while missing countless votes and committee hearings. He tried to make a virtue of his absence during his unsuccessful bid for the GOP presidential nomination, to the point that critics in Florida denounced Rubio for drawing a government paycheck without meeting his basic duties as a lawmaker. However, with growing signs that presumptive GOP presidential nominee Donald Trump is imploding in the polls and may be taking vulnerable Republican candidates down with him, Senate Majority Leader Mitch McConnell (R-KY) is begging Rubio to change course and enter the August GOP primary contest, according to various reports. Although McConnell endorsed Trump for president after he wrapped up the nomination in early May, the majority leader privately has voiced alarm that the billionaire businessman’s candidacy could lead to the demise of the GOP’s control of Congress and the election of Democrat Hillary Clinton as president. McConnell has quietly advised vulnerable Senate GOP incumbents to distance themselves from Trump in the general election campaign to try to save themselves from defeat. The GOP currently holds a 54 to 46 vote advantage over the Democrats and independents. 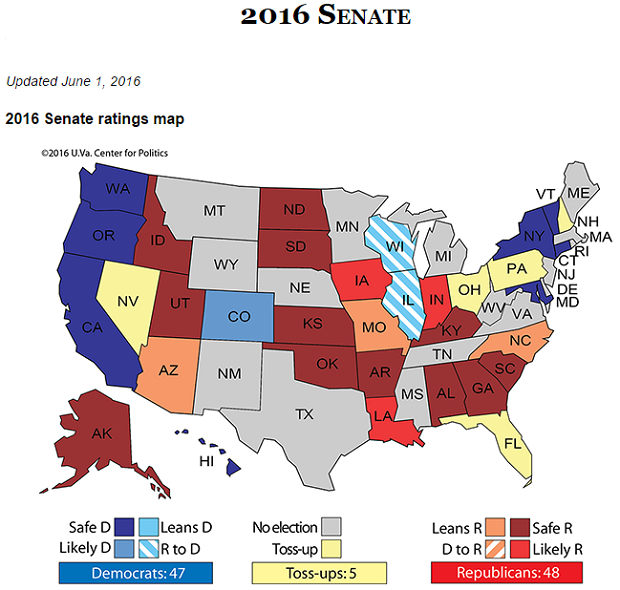 With the Republicans defending 24 seats this year and the Democrats only 10, there is a better than even chance the Democrats can pick up the five seats they would need to reclaim control of the Senate. Sen. Mark Kirk of Illinois, far and away the most vulnerable Republican incumbent, on June 7th became the first incumbent Republican to announce that he would not endorse Trump for president. Other Republican incumbents facing tough reelection battles and who likely will steer clear of Trump include Ron Johnson of Wisconsin, Pat Toomey of Pennsylvania, Rob Portman of Ohio, Kelly Ayotte of New Hampshire and whoever ends up defending Rubio’s seat in Florida. Veteran Sen. John McCain of Arizona is also facing a tough reelection, but for now at least he has endorsed Trump for fear of further alienating Tea Party conservatives in his state. On the Democratic side, Minority Leader Harry Reid of Nevada is retiring at the end of the year, and his seat may be vulnerable to a Republican candidacy. Today, 70 percent of Americans say they disapprove of Trump, and Clinton is leading the race by 12 percentage points in the most recent national poll. Moreover, relations between congressional Republicans and Trump couldn’t get much worse. McConnell, House Speaker Paul Ryan (R-WI) and scores of other prominent Republican leaders have publicly distanced themselves from Trump’s more controversial and outrageous statements, including his repeated calls for barring Muslims from this country, his racist attacks on a federal judge of Mexican heritage and his suggestions that President Obama somehow was connected to the terrorist attack on a gay nightclub in Orlando last weekend that killed 49 people and wounded 53 others. Rubio, 45, who ran unsuccessfully against Trump promising to bring a new generation of conservative leadership to the White House, would by no means be a shoo-in if he were to run again. Two Democratic representatives, Alan Grayson and Patrick Murphy, are seeking Rubio’s seat and both have performed well in hypothetical matchups against the five current Republican challengers for the seat. Related: Obama to GOP Leaders -- Do You Actually Agree with Trump? What’s more, a recent Public Policy Polling survey found that Rubio’s job approval rating among Florida voters is only 32 percent, as many Floridians bridled at Rubio’s cavalier dismissal of his Senate post. Rubio told reporters on Wednesday that he is rethinking his decision to retire from the Senate after only one term, following a conversation he had over the weekend with his friend Florida Lt. Gov. Carlos Lopez-Cantera, a Republican who is running to succeed Rubio. Cantera told Rubio that he would stand aside if Rubio decides to seek a second term.